امیدی, حسین, غفرانی, محمد, ضیائی, محسن, محبی, نعمت الله. (1395). شناسایی و رتبه‌بندی عوامل تاثیرگذار بر توسعه صنعت مبلمان آماده نصب در ایران. مجله صنایع چوب و کاغذ ایران, 7(1), 13-32. حسین امیدی; محمد غفرانی; محسن ضیائی; نعمت الله محبی. "شناسایی و رتبه‌بندی عوامل تاثیرگذار بر توسعه صنعت مبلمان آماده نصب در ایران". مجله صنایع چوب و کاغذ ایران, 7, 1, 1395, 13-32. امیدی, حسین, غفرانی, محمد, ضیائی, محسن, محبی, نعمت الله. (1395). 'شناسایی و رتبه‌بندی عوامل تاثیرگذار بر توسعه صنعت مبلمان آماده نصب در ایران', مجله صنایع چوب و کاغذ ایران, 7(1), pp. 13-32. امیدی, حسین, غفرانی, محمد, ضیائی, محسن, محبی, نعمت الله. شناسایی و رتبه‌بندی عوامل تاثیرگذار بر توسعه صنعت مبلمان آماده نصب در ایران. مجله صنایع چوب و کاغذ ایران, 1395; 7(1): 13-32. صنعت مبلمان آماده نصب تا‌کنون، به گونه‌ای که در سطح دنیا مطرح است، مورد توجه دست اندرکاران و سرمایه‌گذاران صنعت مبلمان کشور قرار نگرفته است. در حالی‌که با رشد و توسعه این صنعت می‌توان به مزیت‌های فراوان رقابتی دست یافت. با عنایت به این مسئله، هدف از این تحقیق، معرفی بازار بالقوه صنعت مبلمان پیش‌ساخته و همچنین تعیین و رتبه‌بندی شاخص‌های مؤثر بر توسعه این صنعت در کشور می‌باشد. برای این منظور پس از بررسی‌ها و مطالعات اولیه و مصاحبه با تنی چند از صاحبان صنایع مبلمان و کارشناسان مرتبط، 42 شاخص کلیدی شناسایی و در 5 گروه کلی اقتصادی، مدیریتی، بازاریابی و فروش، فنی- تکنولوژیک و زیربنایی تقسیم شدند. سپس سلسله مراتب این شاخص‌ها طرح و درجه اهمیت هر یک از آنها طبق اصول فرایند تحلیل سلسله مراتبی توسط نرم‌افزار اکسپرت چویس تعیین گردید. نتایج نشان می‌دهد شاخص‌های مدیریتی و بازاریابی و فروش در سطح اصلی و همچنین زیرشاخص‌های نوآوری در بازاریابی، نوآوری در طراحی، مدیریت عملیات، مدیریت لجستیک، نوآوری در مواد اولیه و ارتقاء محصول در سطوح بعدی سلسله مراتب، به‌ترتیب دارای بالاترین اولویت‌ها برای توسعه صنعت مبلمان پیش‌ساخته در کشور محسوب می‌شوند. Ahmadian, H., 2007. Analysis of furniture foreign trade, the bulletin of Iran furniture manufacturers and exporters union, 114 p. (In Persian). Sadegh, M., 2011. Release of the subsidies, the need for a scientific approach to furniture industry. Magazine of furniture, Decoration & interior architect (Decoman), 90 p.
 Porter, M.E., 1998. Competitive strategy: techniques for analysis of industries and competitors, with a new introduction, Free Press, A Division of Simon & Schuster Inc New York, NY 10020, 422 p.
 Aktrine research Institute, furniture information center. 1999., Overview of the American RTA market, High Point, NC. 6 p.
 Aguinaldo, D., Rocha, C. and Lepre, P., 2010. Barriers and opportunities in developing ‘do-it-yourself’ furniture products for low-income housing. Journal of Construction in Developing Countries, 15:1:29–43. Pepke, Ed., 1993. Ready-to-assemble furniture manufacturing a business plan for the Northeastern area, University of Minnesota, Government Publication Library, USDA Forest Service, 21 p.
 Larry, T., 1996. RTA blasting through old price limits. Furniture/Today, High Point, NC. 21(11): 8-9. Fathollahzade, A., Amiri, S., Doost Hosseini, K . and Faezipoor, M., 2006. A Study of international trade of furniture in Iran. Journal of Iranian Natural Resources, 58(4): 237-248. Adams, L., 1999. RTA furniture seeks a home in the workplace. Wood and Wood Products, 104(10): 26-31. Piza, C., 2013. The European market for ready to assemble furniture, published by CSIL (Centre for industrial studies) reports. 187 p.
 Tajdini, A., Taghadosi, A., Pourmousa, Sh., Jahan Latibari, A., Safdari, V. and Roohnia, M., 2013. Study of Effective indices on wooden furniture imports in Iran. Iranian Journal of Wood and Paper Science Research, 28(2): 205-223. Kolinsky, R., Memedovic, O., Morris, M. and Readman, J., 2003. The Global Wood Furniture Value Chain: What Prospects for Upgrading by Developing Countries.The Case of South Africa, UNIDO, Vienna. Sun, C., 2011. Price dynamics in the import wooden bed market of the United States. Journal of Forest Policy and Economics, 13(4): 479–487. Cohen, D. and Widiyanto, D., 2009. Changing of Transportation Cost for Furniture Exports from China to the United States, 33 p.
 Vlosky, R., Poku, K. and Wille, S., 2001. A market analysis of the ready-to-assemble furniture industry, Louisiana Forest Products Laboratory, Louisiana State University, Baton Rouge, LA. Bramorski, T., Madan, M., Motwani, J. and Sundarraj, S., 2000. Improving competitiveness of ready-to-assemble manufacturers through information technology. Journal of Logistics Information Management, 13(4): 201-209. Cao, X. and Hovgaard, A., 2005. Innovativeness in the forest products industry. Forest products journal, 54(1): 1-8. Gazo, R. and Quesada, H., 2005. Competitive strategy of furniture producers. Forest products journal, 55(10): 66-73. Nemli, G., Hızıroglu, S. and Serin, H., 2007. A perspective from furniture and cabinet manufacturers in Turkey. Journal of Building and Environment, 42(1): 699-1706. Ratnasingam, J., 2005. The Asian furniture industry: the reality behind the statistics. Holz als Roh- und Werkstoff, 63: 64–67. Tajdini, A., Rabie, D., Latibari, A.J. and Pourmoosa, Sh., 2011. Study of effective indexes on exports of wooden furniture in country. Journal of Sciences and Techniques in Natural Resources, 6(2): 71-87. Bahmani, A.A., Rafighi, A., vali, M. and Salari, A., 2012. Identification and Evaluation of on-coming Challenges of Wood and Paper Industries of the Country. 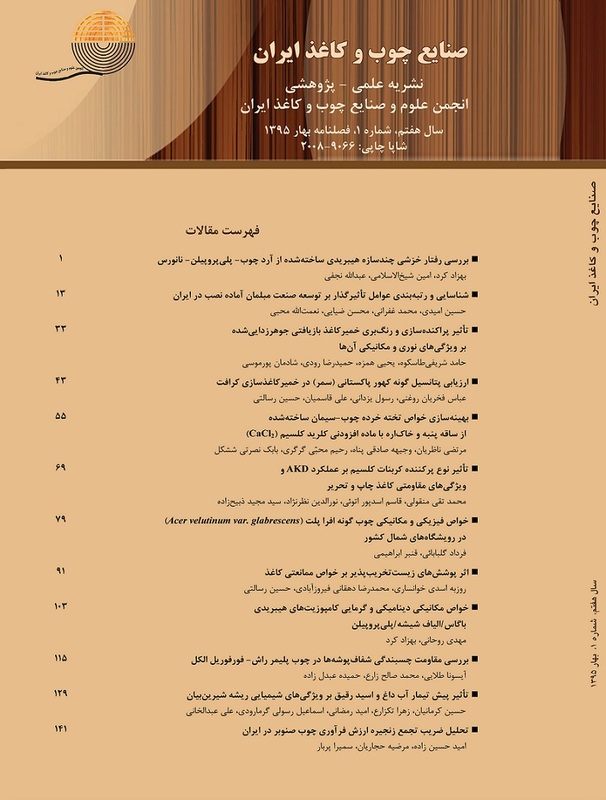 Iranian Journal of Wood and Paper Industries, 2)2(:27-38. Mohebbi, N.A., Azizi, M., Fathollahzade, A. and Mohebbi, R., 2010. Determination of effective criteria on development of IRAN Furniture Industry by Analytical Hierarchy Process. J of Wood and Forest Science and Technology, 17(1): 105-116. Saaty, T.L., 2000. Decision making for leaders, RWS Publications, Pittsburgh, PA, 323 p.
 Asgharpoor, M.J., 1999. Multi-criteria decision making. University of Tehran Press, 398 p. (In Persian). Azizi, M., 2011. Determination of the effective criteria for production manager selection in furniture industry. Journal of Iranian Natural Resources, 61(4): 957-987. Roosta, A., Venouss, D. and Ebrahimi, A., 2008. Marketing management, SAMT press, 420P. Kotler, Ph. and Armstrong, G., 2007. Principles of marketing, Prentice Hall Publication, 736 p.
 Ghaseminejad, y. and Shahmiri, F., 2013. Provide a conceptual framework for Select of new and innovative products ideas. roshde fanavari Magazine, 34)2:(1-11. Bamdad, N., Farjadi, GH. and Riahi, p., 2008. A Model for Marketing Management of Science and Technology Parks. Quarterly journal of Research and Planning in Higher Education,14)3(:69-95. Kotler, Ph. and Keller, K.L., 2009. Marketing Management (13th Edition), Pearson Education International (Prentic Hall Publication), 812p. Pakdel, M., Nayebzadeh, Sh. and Dehghan dehnavi, H., 2011. Assess the impact of market orientation, innovation and customer loyalty on improving of business, Case study: POL Group. Journal of Marketing Management, 10(1): 1-26. Tsu Wee, T.T., 2003. Factors affecting new product adoption in the consumer electronic industry. Singapore Management Review, 25(2): 51-71. Sarfi, F., 2007. Applying ergonomic principles in furniture design. The first applied and science Symposium on Development of Furniture and Decorations Industry in Iran. December 4. Tehran, Iran: 141. Jafarnejad, A., 2007. Modern production and operation management, Tehran University Press.130P. Azar,A., Guyabadi,Gh. and Aminian, Gh., 2001. Hierarchical production planning (the company Ipaco). Modarress Journal, 5)1(:107-127. Seyyedhosseini, S.M. and yadranji Aghdam, B., 2009. Basic model of knowledge management in distributed loop supply chain. Journal of Civil Engineering, Islamic Azad University, 2)1(: 84-96. Razmi, J., 2009. Lean Approach for Lean Production, Tehran Uni. Press,250P. Ghofrani, M., Pishan, S. and Talaei, A., 2014. The effect of core type and skin on the mechanical properties of lightweight sandwich Panels. Iranian Journal of Wood and Paper Science Research, 28)4(: 720-731. Nasiri, N., 2009. Low-weight Honeycomb panels: A good alternative for MDF and particleboard in decoration and interior design. Iran wood, furniture and paper Industry MAG, 46:25-29. Wagenfuhr., 2004. Continuosly produced paper honeycomb sandwich panels for furniture applications, 5thGlobal Wood and Natural Fibre Composites Symposium, April 27, -28, Kassel, Germany. Fadaei, M., 2011. Product life cycle, Iran wood, furniture and paper Industry Magazine, 61:50-55. Rainey, D. L., 2005. Product innovation: leading change through integrated product development, Cambridge University Press, 170P.